Police believe a man they want to question over the attempted murder of a woman in her car in Hampshire was spotted getting into a taxi. The 33-year-old victim was stabbed in the neck, chest and stomach in a service road off Gregson Avenue, Gosport, on 19 September. 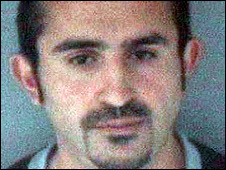 Officers want to question Ozgur Sonmez, 31, from Gosport, over the incident. A man fitting his description was seen getting into a taxi in Bridge Road, Park Gate, on 21 September. The suspect was seen between 0300 and 0430 BST. Det Insp Justin Norris, of Hampshire police, said: "We would appeal for the driver of this taxi to come forward as soon as possible as he could have valuable information to us. "I would also repeat our appeal directly to Mr Sonmez to come forward as soon as possible to assist with our enquiries." Police are advised people not to approach Mr Sonmez.